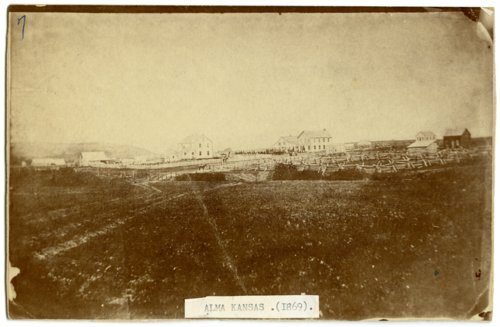 Perhaps the oldest view of buildings in Alma, Kansas, this photograph is dated on the reverse as "Sunday 1869". In this view from the northeast, buildings seen from the left include John Winkler's hotel (the two-story white building), the Schmitz and Meyer Store, and the first Wabaunsee County Courthouse. Other buildings to the right are unidentified. A parade appears to be proceeding down Missouri Street to the north.